Our museum polices and guidelines will help you prepare for your visit. We ask that all groups of 10 or more complete a tour reservation request below to ensure a pleasant visit whether the group requests a docent guide or plans an independent visit. Please try to arrive on time. Docents are on campus by appointment only. They are asked to arrive 15 minutes prior to the scheduled tour time and they are required to wait no longer than 15 minutes after the scheduled time for the visitors to arrive for the tour. Groups will meet docents in the museum lobby near the information desk. The maximum group size we can accommodate on docent-led tours is 50 people at a time (45 children plus five chaperones for 3rd-8th grade, 40 children plus 10 chaperones for K-2nd grade). Large groups will need to divide and take separate simultaneous tours: guided tour groups touring museum galleries may include no more than 10 people per docent to facilitate interaction and to accommodate the various spaces. Large groups visiting campus may wish to walk through the Nerman Museum, and in order to best accommodate museum visitors and avoid crowding, we ask that no more than 50 self-guided high school students or adult visitors congregate at a time in the museum. Instructors and group leaders of self-guided high school and adult groups, please divide your group of 50 visitors prior to arrival: for instance, 25 individuals might visit the 2nd floor while the others visit the 1st floor. 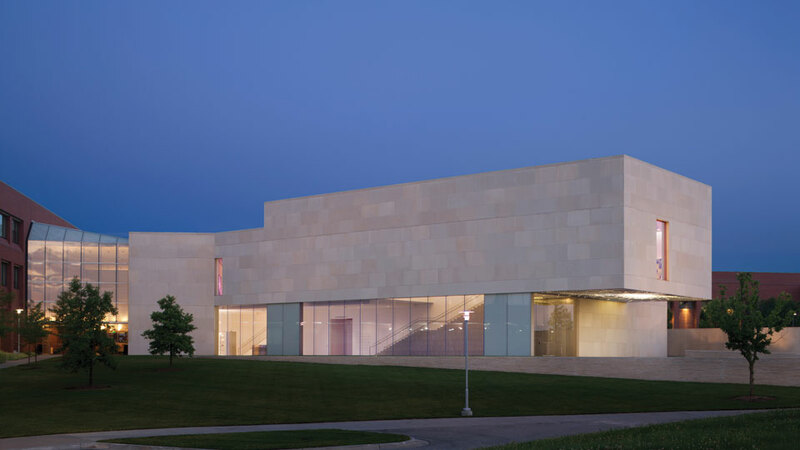 Additional visitors may visit the art on campus in the adjacent Regnier Center or Carlsen Center and then visit the museum galleries while the first group visits the art on campus. When visiting the museum galleries, we require one adult chaperone per five students in 3rd-8th grade; for docent-led groups, one additional chaperone per nine children will suffice. We require one adult chaperone per three students 2nd grade and younger; for docent-led groups, two additional chaperones per eight children is best. For self-guided youth groups, each adult chaperone must keep their group of three to five children together at all times. For safety purposes, we ask that no more than 15 children in self-guided groups gather at a time in any one museum gallery. Teachers and group leaders, please divide larger groups prior to arrival and plan for the appropriate number of adult chaperones. Youth groups without sufficient adult supervision may not be admitted to the museum galleries. Teachers, please make nametags for your students and divide them into groups prior to the visit. Children must stay with the tour group at all times unless escorted by a designated adult chaperone. Children are encouraged to look closely, but may not touch the artwork, including the outdoor sculpture. Please help docents enforce above mentioned regulations. You may be asked to help with doors and elevators while the docent leads the group. You may be asked to take a student to the restroom, or to supervise a student in cases of disruptive behavior. No smoking during a tour, even when passing through outdoor areas. JCCC is a tobacco free campus. Silence cell phones during the tour. Tours may include artworks in multiple buildings or involve walking across campus, so wear comfortable shoes.